Henry VIII's 1513 invasion of France. I've been finishing a few ongoing little projects so I thought I'd cover them all in one post. First up is another house build / kit conversion. Using the kit as a basic shell saves time and as I've found with previous house builds the MDF seems to take the air drying clay quite well. To begin I established which windows I wanted to keep and which I would cover. In doing so I then decided I'd cut out the windows which were to go so that I'd then have some spares for another build, the hole that was left was then filled in with card. The main face lift was the front which required me to remove all of the windows and add two back in a central position. To this I then applied a layer of PVA followed by a rolled out sheet of DAS air drying clay into which I cut out holes where the windows were - just add the whole thing and feel for the windows to cut out. I did a front and side, allowed to dry then repeat. Next was the tedious bit, scoring the brickwork. I started with the quoins on the four corners, then the windows then finally the walls. Though tedious it requires a lot of concentration so for the more complex parts I measured and drew with a pencil first. The roof tiles (Wills rounded tile sheets HO scale) were then glued on to the existing MDF roof of the kit. 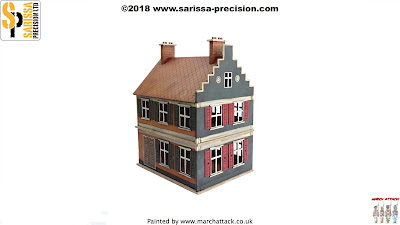 I've found with this and the last kit that I converted that there's a bit of an overhang at the back which looking at the photograph now I'll have to remember to trim off if I do it again. Finally the painting; the whole building had a ochre undercoat followed by a wash of raw umber. The white bits were a blend of ochre and white which was then treated again with a thinner raw umber wash. The whole thing was then finished with a light dry brush and highlighting. Overall I'm quite pleased with it, the roof overhang is a bit of a distraction but it's all part of the learning process I guess. I decided to keep the doors at the side which works quite well, it's quite a useful little multi-purpose piece. The white finished stone gives it an air of being a more well to do home or perhaps an administrative or ecclesiastical building. 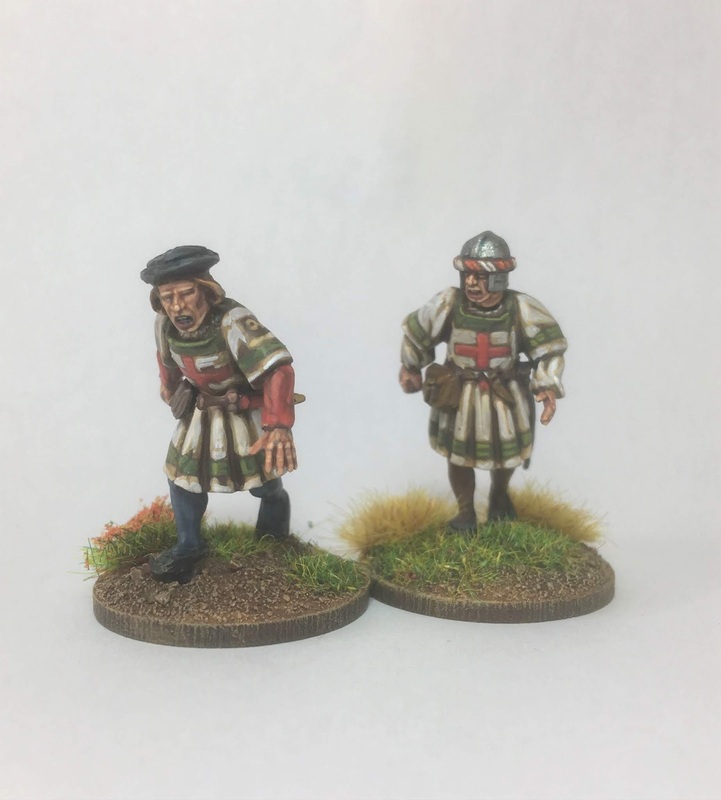 Next up, a couple of battered markers for Lion Rampant. 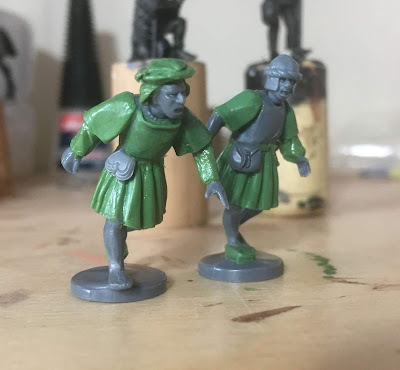 I put these together for a specific scenario which requires 2 prisoners on the run but they also look great as battered markers to show the disintegration of a unit following combat. Both figures had loincloths which were cut away and filed down ready for the skirt to be sculpted on top. The arms are bare so I sculpted a shirt on one figure and doublet on the other. The purse and knife on one is from the Warlord Landsknechts set and the other is from an old Citadel Empire kit, it's a bit on the large side but fits OK. Here they are running away from their unit, they look great don't they ! I think I'll definitely do a few more of these as little side projects to be getting on with. 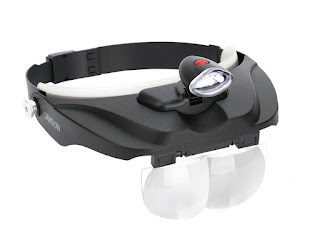 It's a Carson Pro magnifier deluxe. click on the link to see more pictures and a video. I've been curious to get one of them for a while and of late I've had a bit of eye strain, I wear glasses and I'm not getting any younger so I got one. At £35 it's pretty reasonable and I must say it has really revolutionised my painting. The faces on all of the figures above were painted using it. You can flip up the lenses when you're not doing fine detail work, the LED light is great and it's just made fine work far more easier, faster and neater. I wish I'd got one sooner. The wife and daughter think it's hilarious - which it is, especially with massive eyes on the highest magnification lens, it's worth it just for the comedy value. Anyway, if you want to hone your fine work a bit I thoroughly recommend it. How did/what did you use for the window screen effect? There's a crosshatch pattern that's very subtle but adds a lot I think. Great building! Stuart - this output rate is incredible! I love the house. 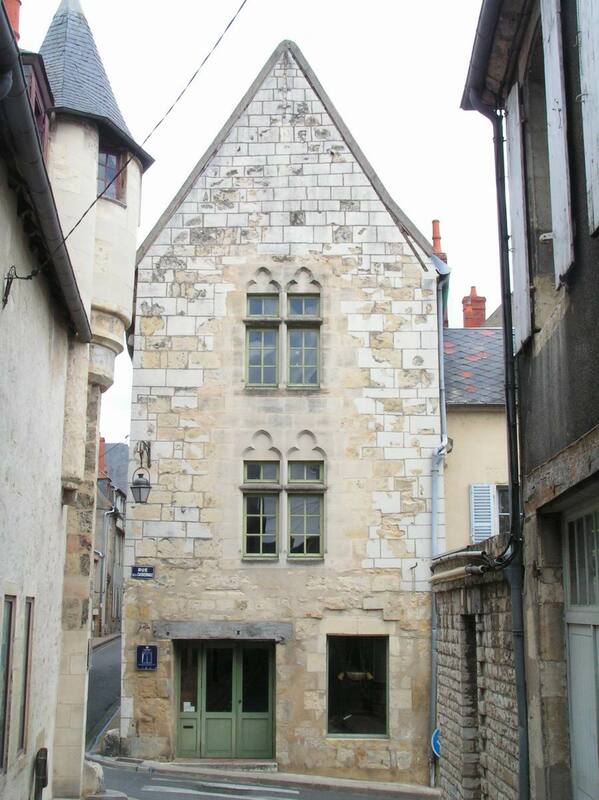 It looks like it could be part of a larger Manor House or Monastic Complex. A really versatile building! 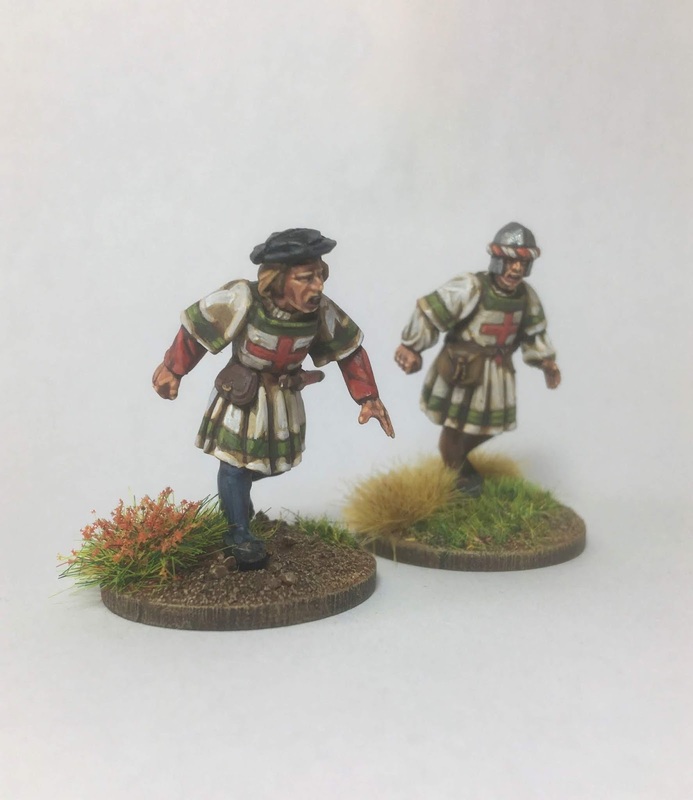 The running archers are superb - you know we will find endless scenarios to use these chaps in. Haha cheers Oli, yep I've done more in the last 6 weeks than the preceding 4 months ! our forthcoming games have certainly caught my imagination and focused the mind somewhat. I think it's definitely a new approach to stick to for me. Great looking building! Lovely work and the fleeing archers are splendid! Lovely looking building Stuart. You are a very talented chap.Im also very impressed with the fleeing figures, well done. 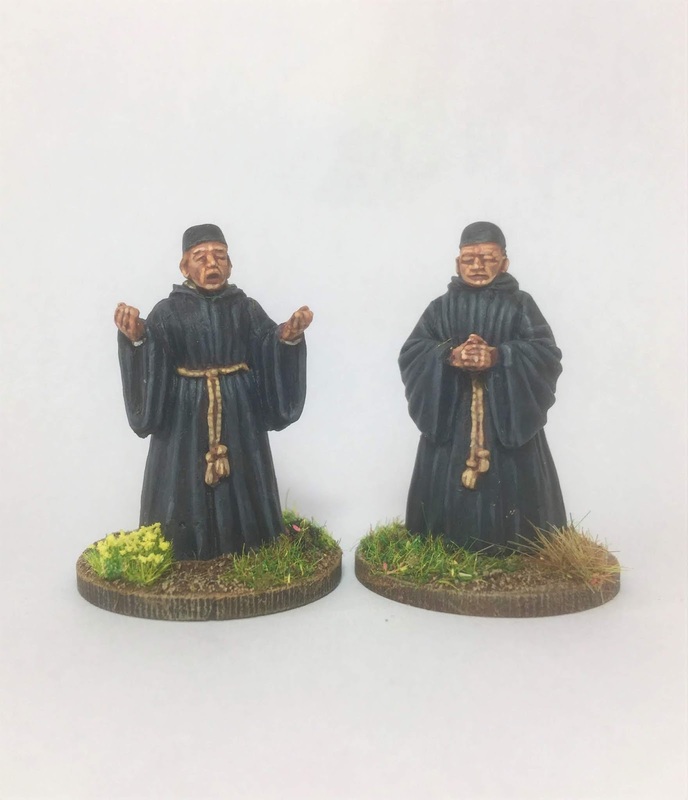 beautiful precise conversions as regards the sculpture of the miniatures both for the building. but how can you be so fast? Beatiful! I like having a chance to enter in the "artist's mind"! Superb! And thanks for the heads up regarding the painting glasses. All excellent and inspiring, as ever. The thing I’m most jealous of is how well you have judged the stone colour. That’s one of the things I always struggle with but yours looks great and a perfect match for your reference photo. Great mdf conversion, very nicely done.